These ladies are so easy to write-off that I'll come right out and admit that I've been guilty of that in a bad way. I look at this band, and I see a cutesy pop group that relies on bubble-gum melodies and their gimmick of being an all-girl group. But what's so bad about any of that? Absolutely nothing as long as the music is tasteful and enjoyable. And that's exactly where the Go-Go's succeed with flying colors. Right off the bat, they deliver what's probably considered their signature tune, "Our Lips Are Sealed." What's so striking about that song is not just the hopelessly infectious melody, but it's the way they play it. It's organic! There aren't any drum machines anywhere! ... Hey, it even sounds more organic and homely than The Cars and with a heck of a lot more personality. Yes, The Go-Go's are your garden variety new wave band. This album was released in 1981, which was just about when new wave became the norm. And, well, it hit the #1 spot on the pop charts and ended up going double platinum. This wouldn't be much of a review if I didn't also mention that Beauty and the Beat was a major milestone for women in rock --- it's the first album to hit the #1 spot from a girl group who wrote and performed their own songs. Cool. .......well, if you really need proof, just take a look at "Automatic." That's not a great song by any means, but it's definitely unusual. A lesser band would have made an ugly and awkward mess out of it, but everything they do seems to work. The robotic feeling of it is strange, but the flawless and inspired way they structure that song is, well, excellent. Read the track review for more details!! Likewise, search inside and out, you're just not going to find a poorly done moment anywhere here. I even like the singing. Lead singer Brenda Carlisle is no Tina Turner, but she has the exact perfect, youthful and carefree tone that's required of this music. Also, it's nice to listen to someone who sounds like a real human being in this world that's currently oversaturated with awful singers such as Hilary Duff and Britney Spear. I'm going to end this review with a quote about Carlisle from Wikipedia that's making me giggle: "Carlisle's first venture into music was a brief stint as drummer for the punk band The Germs under the name Dottie Danger, although illness prevented her from ever performing with them live." Wow, they didn't change what-so-ever. This could legitimately be titled Beauty and the Beat, Part II. Naturally, the good news is if you liked the previous album, then it's a pretty safe bet that you'll like this one as well. Luckily, they proved that they were still capable of writing quality new wave music. Sure, it's not quite as good, but that shouldn't be a big shocker. This continues to be fun music and without any severe lapses of taste. I'd go as far to say that this album is more fun than drugs. .........Um not that I would know what drugs are like unless we're talking about Tylenol or ... allergy meds. Well, it's funner than that. If you read my review of their debut, then you won't need me to describe the music. ... OK, maybe I'll just sum it up to save you the trouble of mouse clicks. This is happy-go-lucky new wave music fully equipped with good beats and good times! Unfortunately, with that comes the inevitable point that these guys had NO diversity. The saminess is a weakness. However, there are enough interesting compositions to keep the material generally sounding fresh. In particular, "He's So Strange," utilizes a minor chord sequence, and "Girl of 100 Lists" reminds me of a pirate shanty. On a more negative note, there's the confused "It's Everything But Partytime." But "Worlds Away," one of the few mid-tempo tunes, serves as a nice conclusion. The biggest disappointment with Vacation is of the more subtle variety. The creativity levels have dropped off a little too noticeably. Whereas almost every composition in Beauty in the Beat had me brimming with glee, there were plenty of times in Vacation in which I merely shrugged my shoulders. Likewise, there's not anything nearly as interesting as "Automatic." They really lost me with their cover of "Cool Jerk," where their youthful exuberance that I hailed so much was reduced to cheekiness. Well, at least it's fun. So, just consider this the weaker sibling of the debut. 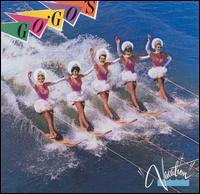 Oh, and the Go-Go's had another hit in this album. It's called "Vacation." I'm sure you've heard it before; it's everywhere! It hit #8 on the charts!!! Yay!!!!! Geez, the Go-Go's were short-lived! This is their third and final album. They would have a reunion in 2001, but that doesn't really count. I guess they were really experiencing tension within the group thus igniting a seemingly premature break-up. These guys also were never exactly major *artists*, anyway, so they probably didn't have much calling to go on together. That is, they weren't exactly ones who wanted to challenge themselves or others with their music. Their only goal in music was just to make happy-go-lucky compositions. They did change their sound a bit for this release. This continues to be similar to Beauty and the Beat, but not quite to the point where I can legitimately title it Beauty and the Beat III. The most striking difference it's much more guitar heavy. They're no longer penning so many bubble-gum surf-rock tunes. Obviously, I like that they altered their sound! Plus, they seem to have taken this opportunity to prove to the world that they were capable of rocking out if they wanted to. They just didn't want to until now! Despite the frustratingly half-hearted electric guitar solos that pop up every once in awhile, I really like hearing some of their crunches. All of that should have made an immensely enjoyable album, but unfortunately their songwriting just wasn't so up to snuff. Where are the memorable melodies? What they have is usually fine, but this constitutes another considerable step down for them. The biggest problem of them all, however, has yet to be discussed! And if you read my previous two Go-Go's reviews, I bet you were able to predict it. I reported that The Go-Go's lost some of their spark in Vacation compared to their unstoppable, carefree debut. Well, Talk Show continues down that path, and they're even dimmer stars than they ever were before. This is to the point where I can't say I'd recommend this release to anyone except particularly devoted fans of Vacation. The only A-level composition here is "Head Over Heels," which is rather joyous. It's more heavily produced than their previous hits, but there was nothing wrong with that as long as it's still fun. The melody is catchy and doesn't betray their happy-go-lucky writing style. Unfortunately, that's the only excellent song here. The rest is a mixture of tasteful though entirely middle-of-the-road material that are so unremarkable that they're not worth mentioning by name. Sure, they're fun to hear, but they're entirely forgettable, and I can't say listening to this album was such a valuable experience. What a pity. One thing that immediately surprised me. The B-52's were the opening act. I'd assumed they would be the main attraction, and The Go-Go's (who had one great album and only two others) were going to be the warm-up act. Judging from my perspective, after all, The B-52's had two great albums (their debut and Wild Planet), four good albums (Whammy!, Bouncing off the Satellites, Cosmic Thing, and Funplex), and two OK albums (Mesopotamia and Good Stuff). 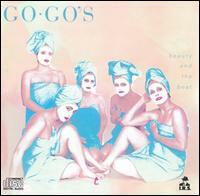 In other words, in terms of sheer quality of output, The B-52's have The Go-Go's beat handily. This is one of many instances I wish dearly that I had a photographic memory. However I will try to capture the essence of all the other jokes Schneider said, albeit my wording might be completely off. "Hey, what's this I hear about the government looking at my privates? They better not be looking at my privates! ... I don't want the government using their high-powered, flying telescopes looking at my privates. ... Or drones. Or whatever." ...And since I guess this was the opening act, not a whole lot of people were standing. "Hey we're a dance band," he said to everyone, "so if you are so inclined..."
I know I made it a bit of a big deal when I thought Alice Cooper pointed at me during his show last November and screamed at me "You're poisonnnnnnnn!" But then, I thought, he could also very well have been pointing at either person next to me. But this time, I saw Fred Schneider look at me dead in the eyes and ask me "Is that you, Mo'dean?" Of course he was doing that to a lot of people, and the crowd was quite dense. But the reason I'm certain it was precisely me is because I was one of the few people in that vicinity who was standing. And I was also wearing a red hat. In other words, I was begging to be noticed. I was also wearing my new B-52's T-shirt I'd bought for $25. It was best T-shirt of all time. Was I "Mo'dean," though? He didn't even give me the chance to respond. Only a few seconds later, he turned to someone else and asked the same question. How can anyone find �Mo'dean,� if you don't even give people a chance to respond? ...Or maybe he was only being rhetorical? Or, perhaps, �Mo'dean's� eyes would make laser green flashes on only a split second's notice after being posed with the question, so Schneider was able to tell immediately that I was not, in fact, �Mo'dean?� ...Well, it turned out I wasn't actually Mo'dean, so there was no harm done. Oh look, I snapped a pic. One song I was never expecting them to perform that made me tear up a little bit was "Girl from Ipananema Goes to Greenland." Surely not the best song they ever did, but it's one song that I've in particular had stuck in my head for the last two years. Cindy Wilson's vocals were enormous and boisterous in the studio cut, and they were just as much hearing it in person. Another pair of appreciated songs came from what's their most under-appreciated album, Whammy! : "Whammy Kiss" and "Legal Tender." Both excellent synth-pop numbers. Naturally, of course, there were the huge classics they covered: "Planet Claire," "Rock Lobster," "Private Idaho," "Mesopotamia," "Party Out of Bounds," and "Love Shack." (I hadn't really noticed this before people kept on bringing it up, but there is some mystery surrounding the thing Cindy calls out during that song... "Tin roof...rusted!" I guess I always thought that meant their tiny little shack had a rusted tin roof, and never really thought that much about it, but ... People say it has a secret meaning of some sort. Hmm.) But they did not perform "Cosmic Thing!" That's OK, though, because I heard them sing that song in 2011. The main comment and/or complaint I had about that concert in 2011 was the lack of material from their debut album. They made up for that here with the additions of "Lava," "Dance This Mess Around," and "6060-842." ...I might have preferred hearing �Hero Worship� instead of the latter song, but... maybe next time? By the way, since I saw them last, Keith Strickland had left the touring band. He was replaced by a man wearing red pants who, I swear gave off a major Ricky Wilson vibe. 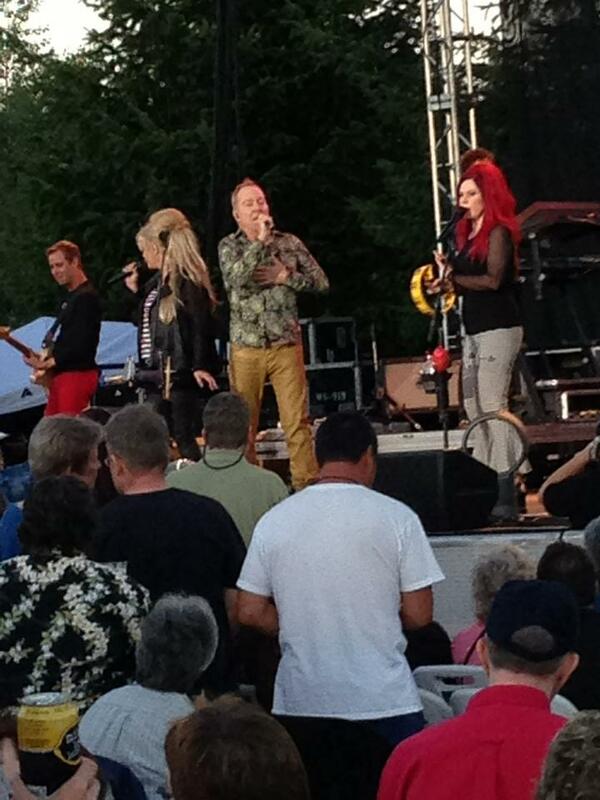 So The B-52's were only the opening act. And the main act, while I can't say I like them any more than The B-52's, I have more of a long and storied history with them. Early on in my reviewing "career," I made a Go-Go's page. I don't remember what had prompted me to create one, but I did. I believe, then, I had written mildly sarcastic reviews and arrived to lukewarm conclusions about them. Since then, I had figured out how to enjoy music a little better and I revised those reviews to be more glowing! Anyway, what a great band to compliment The B-52's? The last time I saw them, they were paired a bit oddly with the cerebral Human League. This time, it was two party bands. Neither of these bands want you to think too deeply. They just want you to have fun. And they succeeded. The concert consisted of a vast majority of songs from their debut album, which was great. That is indisputably their best album, full of energetic tunes that are catchy as hell. The big moments were, of course, �We Got the Beat� and �Our Lips Are Sealed.� At the very end of the show, before the encore, they actually coupled �We Got the Beat� with �Rock and Roll all Nite,� meaning that the concert would go out with a Kiss cover. An unexpected choice, for sure, but as I also enjoy the Kiss song for its pop value, it ended up working great. 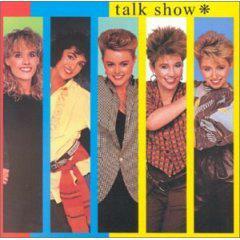 (There's also no question I prefer hearing The Go-Go's sing that song than Kiss...) A few other songs from that album that are almost as good was �Don't Stop the World,� �This Town,� and �How Much More.� Naturally, of course, they also performed the title track from their sophomore album. Since Carlisle was also independently famous as a solo artist, they took the opportunity to perform one of her solo songs. (Which is appropriate, since many of her solo songs were composed by Charlotte Caffey). I remember Weidlin's introduction to this song, expressing admiration of Carlisle for having an illustrious solo career. In Weidlin's spare time, she said, she lays about in bed and eats chocolate. They sang �Mad About You,� quite probably the best song to come out of Carlisle's solo career. Well, I've not much else to add about this concert other than it was a blast. It was yet another concert for the ages. (I could have added the story about me, before the concert, visiting a Cabela's and buying one of the worst pairs of jeans that I've ever owned. But I won't.) Would I go to this concert again? You bet I would. It was one of the highlights of the season.